Background Several recent studies published have suggested that T cell exhaustion exists both in chronic infection and cancer. However, to date, few studies have investigated their differences. Here we designed this study to explore the genetic and phenotypic difference in CD8+ T cell exhaustion between chronic hepatitis B (CHB) and hepatocellular carcinoma (HCC). Methods In this study, we assayed the phenotypes and functional states of CD8+ T cells separating from human CHB tissues and HCC tissues, and re-analyse the single-cell sequencing data (GSE98638) published previously. Clustering analysis of genes was performed using the T cell exhaustion gene modules (modules 1–4) proposed by Speiseret al. Results CD8+ T cells from liver tissues of both CHB and HCC showed high levels of exhaustion markers, DOI: programmed cell death-1 (PD-1), T-cell immunoglobulin and mucin-domain containing-3 (TIM-3), cytotoxic T lymphocyte-associated antigen-4 (CTLA-4), and lymphocyte-activation gene 3 (LAG-3), decreased proliferation (Ki67) and cell activity (CD69), and reduced production of effector cytokines (interferon-γ, interleukin-2 and tumour necrosis factor-α). Compared with CD8+ T cells from CHB tissues, those from HCC tissue showed higher expression levels of exhaustion markers, lower levels of proliferation, cell activity and the production of effector cytokines. Cluster analysis showed that exhaustion associated genes in CHB and HCC are inclined to distribute into modules 3 while those isolated from HCC into modules 1 and 2. Conclusions CD8+ T cell exhaustion existed both in CHB and HCC, but the phenotypes, functional states and underlying mechanisms are somewhat different between the two. Immunotherapy has emerged as one of the most promising areas in cancer treatments in recent years.1 2 CD8+ T cell is one of the primary effector cells of anticancer immunity.3 However, CD8+ T cells infiltrating in cancer and/or chronic infection tissues are generally in dysfunctional states termed T cell exhaustion.4 5 Therefore, to study CD8+ T cell exhaustion may provide novel avenues to improve anticancer immunity. Several recent studies published have suggested that T cell exhaustion exists in both chronic hepatitis B (CHB)/chronic hepatitis C and hepatocellular carcinoma (HCC).6–9 And it has been proposed that T cell exhaustion in chronic infection and cancer might be different due to different microenvironments;4 10 11 however, few studies have systematically investigated this difference to date. In this study, we used CHB liver tissues and HCC tissues to explore the differences in CD8+ T cell exhaustion between chronic infection and cancer. CD8+ T cells from CHB liver tissues and HCC tissues were separated respectively and their phenotypes and functional states were assayed (refer to supplemental information about patients’ clinicopathological characteristics). As shown in figure 1A, the expression levels of exhaustion markers such as PD-1, TIM-3, LAG-3 and CTLA-4 in CD8+ T cells from liver tissues of both CHB and HCC were significantly higher than those from the corresponding peripheral blood mononuclear cells (PBMCs). And the functional states of CD8+ T cells from both CHB and HCC were compromised as evidenced by decreased proliferation (Ki67) and cell activity (CD69) (figure 1B), and reduced production of cytokines such as interferon (IFN)-γ, interleukin (IL)-2 and tumour necrosis factor (TNF)-α (figure 1C). These results suggested that CD8+ T cell exhaustion exists in the course of both CHB and HCC. Differences in CD8+ T cell exhaustion between chronic hepatitis B (CHB) and hepatocellular carcinoma (HCC). Flow cytometry assay of CD8+ T cells from peripheral blood mononuclear cell (PBMC) from healthy individuals (healthy PBMC CD8+, n=40), from patients with HCC (HCC PBMC CD8+, n=40), CD8+ T cells infiltrating in CHB tissues (CHB CD8+, n=40) and CD8+ T cells infiltrating in HCC tissues (HCC CD8+, n=40). (A) The expression levels of exhaustion markers including PD-1, TIM-3, LAG-3 and CTLA-4 were significantly higher in HCC CD8+ T cells than those from PBMC CD8+ T cells from the same patients. 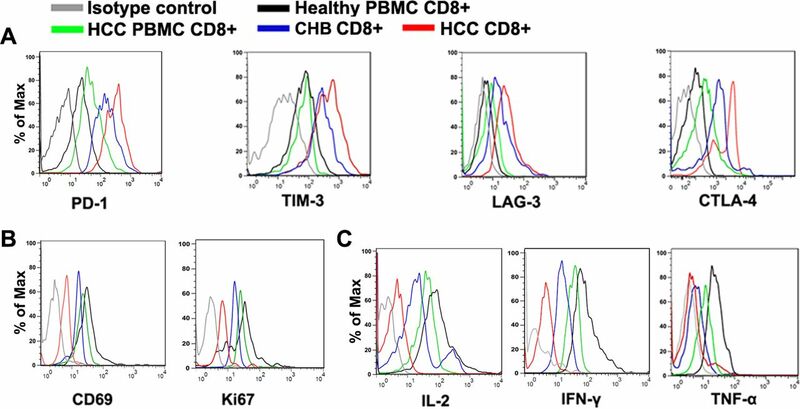 (B, C) The functionalities of CHB CD8+ T cells and HCC CD8+ T cells were compromised as evidenced by decreased proliferation (Ki67) and cell activity (CD69) (B), and reduced production of cytokines such as interferon (IFN)-γ, interleukin (IL)-2 and tumour necrosis factor (TNF)-α (C). However, the phenotypes and functional states of CD8+ T cells from CHB and HCC tissues showed some differences. Compared with those from CHB liver tissue, CD8+ T cells from HCC tissue showed higher expression levels of exhaustion markers such as PD-1, TIM-3, LAG-3 and CTLA-4 (figure 1A), lower levels of proliferation and cell activity (figure 1B) and reduced production of effector cytokines mentioned above (figure 1C). These results suggested that there are some differences in phenotypes and functional states between CD8+ T cells in CHB and HCC and that the exhaustion levels of CD8+ T cells in HCC are higher than those in CHB. To further explore the differences and underlying mechanisms in T cell exhaustion in CHB and HCC, we reanalyse the data (GSE98638) of single-cell sequencing of T cells infiltrating in hepatitis B virus-positive HCCs reported by a recent study published in CELL.12 In our functional clustering analysis (Materials and methods, supplemental Information), we found that CD8+ T cells infiltrated in CHB and HCC tissues showed different distribution patterns, indicating the differences in their functional properties (figure 1A, B). Next, we conducted clustering analysis of CD8+ T cells from CHB and HCC tissues respectively using the T cell exhaustion gene modules (online supplementary figure 1) proposed by Speiser et al,4 in which different gene modules represent different mechanisms underlying different patterns of T cell exhaustion. We found that genes of CD8+ T cells from CHB were inclined to distribute into modules 3 while those isolated from HCC into modules 1 and 2 (figure 2C, D), suggesting that CD8+ T cell exhaustion in CHB and in HCC may be driven by different pathways, although the underlying mechanisms remain to be explored. Reanalyses of the single-cell sequencing data (GSE98638) of T cells infiltrating in hepatitis B virus-positive hepatocellular carcinoma (HCC) revealed different functional properties and gene distributions. 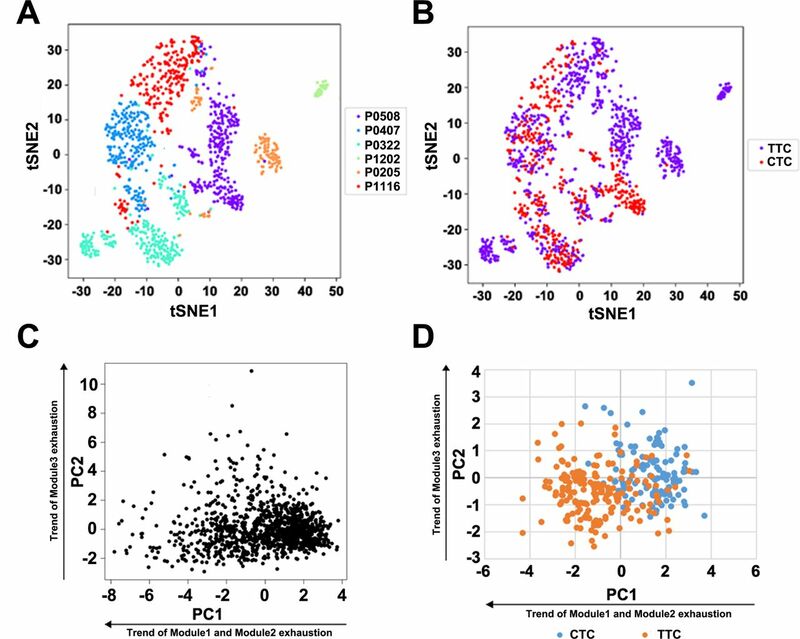 (A, B) t-Distributed Stochastic Neighbor Embedding (tSNE) analyses of CD8+ T cells from chronic hepatitis B liver tissues (CTC) and from HCC tissues (TTC). CD8+ T cells from different patients presented different gene expressing patterns (P0508/P0407/P0322/P1202/P0205/P1116 were patients’ IDs) (A); CTC and TTC showed different distributions, implicating their different functional properties (B). (C, D) Clustering analysis of CTC and TTC based on the T cell exhaustion gene modules (online supplementary figure 1) proposed by Speiser et al.4 In our principal components analyses (PCA), the four gene modules proposed by Speiser et al 4 fell into two sets: set 1 included modules 1 and 2 exhaustion whereas set 2 included module 3 exhaustion (C). PCA showed that exhaustion-associated genes in CTC and TTC distributed differently: genes of CTC were inclined to distribute into modules 3, whereas those from TTC into modules 1 and 2 (D). CTC, CD8+ T cells from chronic hepatitis B liver tissues; CTH, T helper cells (CD4+CD25–) from chronic hepatitis B liver tissues; CTR, regulatory T cells (Treg cells, CD4+CD25high) from chronic hepatitis B liver tissues; PTC, peripheral blood CD8+ T cells; PTH, peripheral blood T helper cells (CD4+CD25–); PTR, peripheral blood regulatory T cells (Treg cells, CD4+CD25high); TTC, CD8+ T cells from HCC tissues; TTH, T helper cells (CD4+CD25–) from HCC tumour tissues; TTR, regulatory T cells (Treg cells, CD4+CD25high) from HCC tumour tissues. In summary, based on our own experiments and reanalysis of existing single-cell sequencing data, we showed that CD8+ T cell exhaustion existed in both CHB and HCC, but the phenotypes, functional states and underlying mechanisms are somewhat different between the two. Future explorations into the mechanisms underlying these differences in chronic infection and cancer might provide new insights into T cell exhaustion as well as potential targets to reverse T cell exhaustion. Fresh human HCC tissues and para-tumorous tissues (n=40) (the tissue volume was recorded) were obtained from patients that undergone liver resection. Human peripheral blood was collected from patients with HCC (n=40) or healthy volunteers (n=40, 10 mL each). Single-cell suspensions were softly added to the surface of 10 mL Ficoll-Paque (GE Healthcare), then centrifuged at 400×g for 30 min at 20°C according to the manufacturer’s instructions. CD8+ T cells were separated from PBMC or tumour-infiltrating lymphocytes by anti-human CD8 beads. Patients’ characteristics are shown in online supplementary table 1. Isolated T cells were collected by centrifugation (330×g, 5 min at 4°C) and cell counts were determined using a Countess Counter (Invitrogen, New York, USA). For surface staining, cells were resuspended in phosphate buffered saline (PBS) (with 2% fetal bovine serum (FBS)) containing the antibody, incubated on ice for 30 min, washed in PBS (with 2% FBS) and analysed using flow cytometry (CANTO II, BD Biosciences, New York, USA). Fixation and permeabilisation buffers (eBioscience, California, USA) were used for intracellular molecule detection according to manufacturer’s instructions. CD8+ T cells were stimulated with anti-CD3/CD28 beads (Thermo Fisher Scientific, Massachusetts (MA), USA) at a 1:2 bead-to-cell ratio. CD8+ T cells used for CD69 assay were pretreated with phorbol 12-myristate 13-acetate (PMA, Sigma-Aldrich, Massachusetts, USA, 25 ng/mL) and ionomycin (Sigma-Aldrich, 1000 ng/mL), whereas those used for IL-2, IFN-γ and TNF-α assay were pretreated with PMA (50 ng/mL), ionomycin (1000 ng/mL) and Brefeldin A (BFA, Sigma-Aldrich, 5000 ng/mL). Data were collected on BD CANTO II (BD Biosciences) with FACS Canto software V.2.1 (BD Biosciences). Antibodies used were described in online supplementary table 2. Data of reads count of all cells were downloaded from GEO as described by Zheng et al followed by normalisation using DESeq2 V.1.16.1.12 The logarithm value of the raw reads count as described by Chunhong Zheng et al 13 was obtained for the downstream analysis. When performing principal components analyses (PCA) and clustering, the data from all cells were included, and genes whose reads counts were >1 in at least one cells were included (online supplementary figure 2). PCA was done by the ‘prcomp’ function of R V.3.2.2, and t-Distributed Stochastic Neighbor Embedding was done by the ‘Rtsne’ package V.0.13 (https://github.com/jkrijthe/Rtsne). The heatmap was generated by ‘pheatmap’ package V.1.0.8 (https://cran.r-project.org/web/packages/pheatmap/index.html). XW, QH and HS contributed equally. Contributors Conception and design: BS and X-JL. Provision of study materials or patients: XW, QH and HS. Collection and assembly of data: QH and HS. Data analysis and interpretation: XW and QH. Manuscript writing: BS, X-JL and XW. Final approval of manuscript: all authors. Funding This work was supported by grants from the National Key Research and Development Program of China (grant number: 2016YFC0905900 to BS); the State Key Program of National Natural Science Foundation (grant number: 81430062 to BS); Innovative Research Groups of National Natural Science Foundation (grant number: 81521004 to BS), the National Natural Science Foundation (grant number: 81772596 to X-JL) and the Postgraduate EducationReform Project of Jiangsu Province (JX22013394 to X. W).This work was also supported in part by the Priority Academic Program of Jiangsu Higher Education Institutions. Competing interests BS is Yangtze River scholars Distinguished Professor. Ethics approval Approved by the First Affiliated Hospital of Nanjing Medical University.